Spey Casting Made Easy - learn to Spey cast. “Spey Casting Made Easy” is not a new fly fishing school; courses have been running successfully for over ten years in UK, Ireland, Italy, Norway, USA and Canada and have achieved a high level of customer satisfaction. An illustrated booklet detailing the essential dos and don’ts of Spey casting is provided to each student. Rods, reels and variety of Spey casting lines by leading manufacturers are available for use during the course if required. 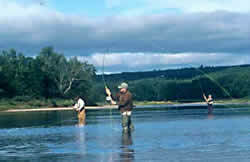 The main objective of the course is to enable students to understand the theory and methods of Roll and Spey casting techniques and to practice the casts on the river under Ally’s expert guidance to achieve a reasonable standard of performance within the two day program. Previous experience of fly casting is not necessary because the lessons will assume no previous knowledge. Starting with the essential rules of fly casting each student’s understanding of the techniques will be developed in a clear manner with the aim of achieving efficient casting styles. Other learning opportunities include salmon fishing tactics and fly tying. Introductions followed by a short illustrated talk/discussion about salmon fly fishing and fly casting by Ally Gowans. Fly casting instruction will commence with the Roll cast and Switch cast and develop these into the Single Spey cast. Different styles and common problems with the Single Spey cast will also be discussed and explored. A similar analytical approach will be taken to teach the Double Spey cast, which is usually an easier technique for beginners to perfect. Other roll and Spey casting techniques including the Snake Roll, Snap Tee, Underhand cast and the whole family of single handed Spey and Roll casting techniques will be demonstrated and taught to complete a comprehensive introduction to the topic. Moving onto practical fishing tactics sunk line fly casting and fishing techniques will be demonstrated and taught and finally attention will turn to understanding floating line tactics and methods. A fly tying session will demonstrate making modern shrimp, hair-wing and tube flies for salmon and sea trout fishing. Throughout the event students will be encouraged to participate in free and wide ranging discussions relating to salmon fly fishing.